I still own a Samsung Series 7 Chronos 17.3″ (NP700Z7C). I purchased it in May 2013 with 8GB ram and a 1TB hard drive. It came with Windows 8 installed. Over time I’ve replaced the HDD with a Samsung SSD, and the OS has upgraded from Windows 8 to 8.1 to 10. During the Windows 10 period I made the questionable decision to become part of the Insider’s Program (the part they call the “slow ring”). It’s been a long roller coaster ride, sometimes good, sometimes bad. I was given an opportunity to get off that roller coaster, and because of some really bad experiences, I took it. As of today I’m off. What drove me off the Insider Program was a constant failure during the last set of pre-releases to perform a download and update. Time after time, over a several month period, updates failed. Microsoft provided no official fixes, and I went looking (i.e. “googling”) for possible solutions. Either the recommended forum solutions didn’t work or on a lot of web sites I ran into popups trying to do all sorts of mean and nasty things. I’ve got a system with all updates and I’ve got a lot of features disabled or uninstalled to harden the system’s security posture. That’s no guarantee that bad things won’t ever happen, but it does help. To keep you from falling into the same questionable sites here’s what I used to fix the update failure problem and it comes from Microsoft and an official Microsoft web site. 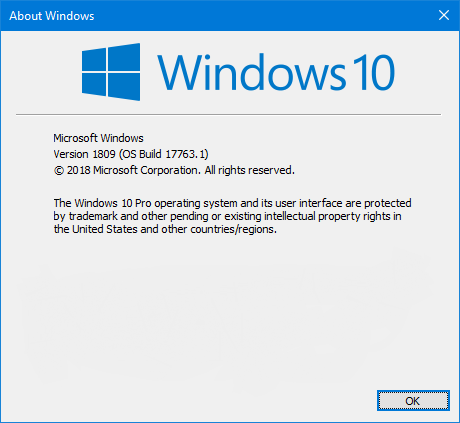 Go to https://support.microsoft.com/en-us/help/10164/fix-windows-update-errors and select Windows 10 at the bottom of the page. This will open up a new section at the bottom for Windows Update Troubleshooter. Download it, execute it, and follow its directions. If I’d found this sooner it would have saved me a week of evenings of grief. Like I wrote above, I’m off the Microsoft Insider Program roller coaster, and I’m glad to be back on solid ground. I wrote in an earlier post about easily installing multiple applications on macOS. One of those applications interestingly enough is Microsoft’s PowerShell. Microsoft has open sourced PowerShell and made it available on GitHub (https://github.com/PowerShell/PowerShell). From GitHub you can either grab the source and build it yourself, download and install a pre-built binary, or both. I chose to just grab the binary and run with it as I have enough projects to keep me occupied as it is. The current PSVersion is 6.0.0-beta, and it’s shown running on macOS 10.12.5. 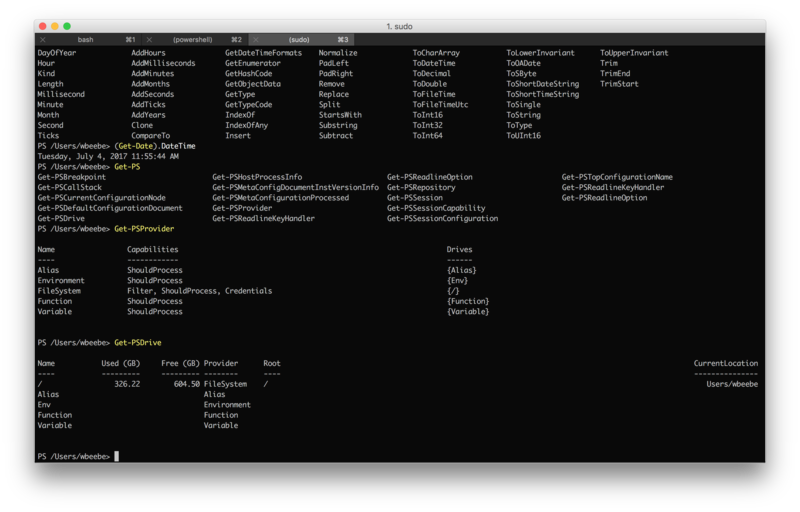 I start PowerShell for Mac from the ITerm2 command line, and from there I can look about PowerShell all I want. While the shell appears feature complete as far as syntax is concerned, PowerShell for Mac is missing considerable core .Net functionality when compared to the versions that run on Windows. As one small example shows below, Get-PSProvider doesn’t show the provider for the registry, as there is no equivalent (at all) on macOS. 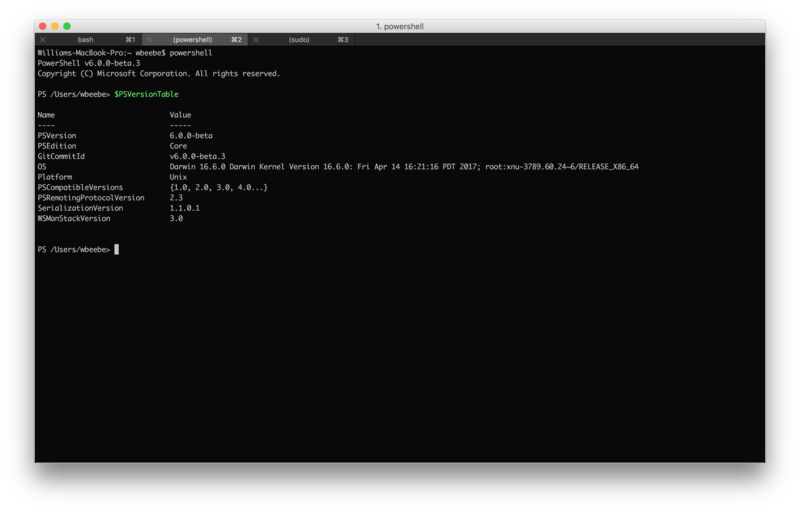 While it’s nice to have the same shell running across multiple platforms, as bash does, PowerShell for Mac and Linux isn’t going to be nearly as useful as it is on Windows if you want full Windows functionality on another OS. Any PowerShell scripts that are developed to take heavy advantage of Windows OS functionality are going to fail pretty hard on both the Mac and Linux, just to give you fair warning. If you decide to update PowerShell’s help, then run PowerShell as sudo before running Update-Help, or the updates will fail. The graphical view of help (via -ShowWindow) isn’t implemented and won’t work. One tool not provided by the PowerShell project is the PowerShell ISE (Integrated Scripting Environment). The ISE is bundled with every copy of Windows these days, and is a powerful way to write and debug PowerShell scripts of any complexity on Windows. 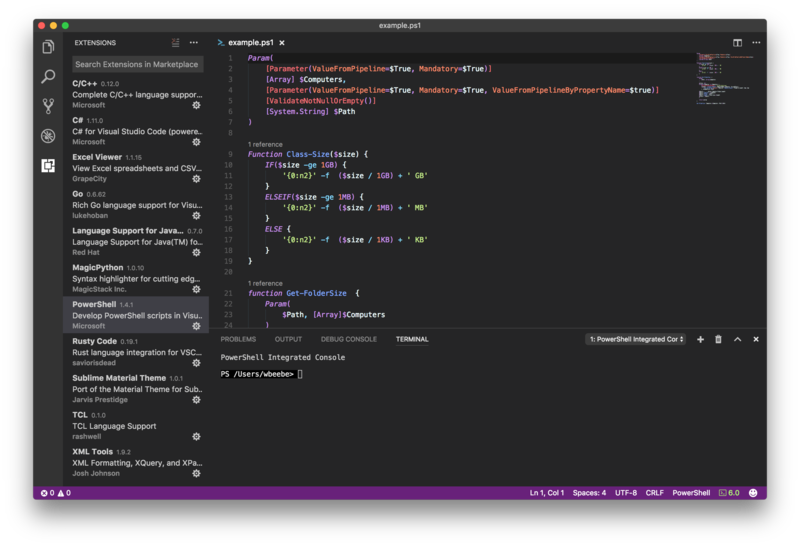 For the Mac the next best tool to use is Visual Studio Code with the PowerShell v1.4.1 extension (see below). You get full syntax highlighting and support as well as a split screen with code at the top and a PowerShell prompt at the bottom. The only major feature missing in this setup is the help section that is displayed to the right (by default) in the native ISE. PowerShell for Mac and Visual Studio Code for Mac are an interesting counterpoint to Windows Subsystem for Linux on Windows 10. For those folk who like to “swim” in the lower regions of coding and operating systems, we’re living in a golden era.